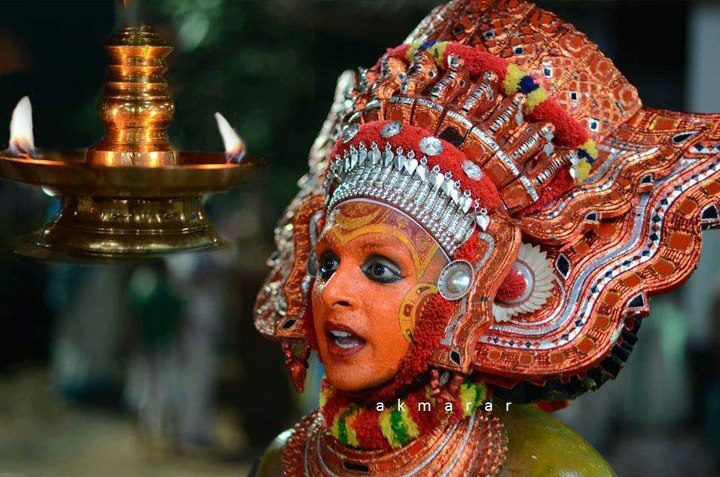 The Theyyam most prominently understood as the dance of Gods is a popular Hindu ritual form of worship of North Malabar in Kerala state predominantly in Kasargod, Kannur and Wayanad district. This fascinating, divine ritual is a combination of folk music, dance, ancient legends, and rituals. If you are visiting North Kerala then to watch Theyyam is a must be done activity here. Visitors outside Kerala are guided if you book accommodation at Broad bean hotel, which is one of the best five-star resort in Kerala. It also has its branch at Kannur. Theyyam is a package added by them to entertain and welcome their guests with immense pleasure.The best time to watch Theyyam performance is during November to April as it is the season when temples and small shrines in villages conduct their annual festivities. The best part regarding Theyyam is that this is an art form which is equally involved in all categories of Hindu caste because this art form is performed basically by the indigenous tribal community and is organized by the high castes. Thus we can say that it embraces all the caste and classes of the Hindu religion n this region.This art form is actually a form of worship and sometimes it involves offerings as liquor and meat to the goddess. Since Theyyam is sponsored by members of ruling caste during temple festivals, it is enjoyed with equal vigour.There are many Kerala hotels are in Kannur with best accommodation services.Broad Bean is one among them.So plan your Kerala trip with Broad Bean hotels in Kannur.